Not real aliens. Obviously. We’re talking gaming here. Our customer had a high “spec” gaming PC which was shutting down about a minute after starting it up. Sometimes it wouldn’t start up at all. He had some software which was showing the CPU temperature was around 85° in an idle state (ie with just the Windows desktop open). Now, these machines are designed to work with the CPU reaching high temperatures but 85° with nothing going on is a bit too frisky, even for the spec he has. The system was shutting down before the CPU got fried. Our customer is pretty computer savvy and had cleaned the PC but the problem persisted. That’s when he called us. 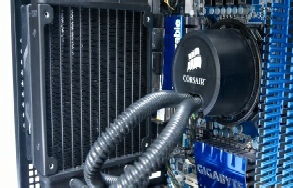 His CPU was being cooled by a liquid cooler very similar to the one in the picture above. That thing with the 2 tubes is the liquid cooler. We noticed that one of the tubes and the cooler/heat-sink sitting over the CPU were too hot to touch comfortably. Our recommendation was to change the liquid cooler asap. Our customer ordered a replacement cooler and we removed the old one, took the CPU out and cleaned the old thermal paste off, fitted the new cooler and booted the machine up. The result? His CPU was now running at around 30° idle and he was up and running and zapping aliens in no time!